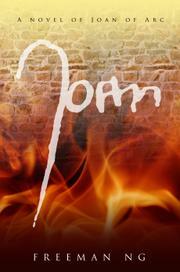 Debut YA that fictionalizes the life of Joan of Arc. Ng begins this tale in the early 1400s with the childhood of Joan of Arc. The story is told in the second person, with the narrator addressing St. Margaret of Antioch, who has returned from heaven years after her death to provide Joan with messages from St. Catherine and the archangel Michael. These biblical figures instruct Joan to leave her childhood home in Domremy and assist King Charles VII in rescuing the French from British dominion. When Joan finally travels to Chinon to see Charles, Margaret is her near-constant (but always invisible) companion. During Joan’s journey, Ng provides many interesting details about life in France during the 15th century, as well as the battle between the French and the English (now known as the Hundred Years’ War) that had been ongoing since 1337. When Joan reaches Chinon, she is laughed at for insisting that she join the fight. As a young girl in an extremely male-dominated era, Joan must exhibit tremendous perseverance, patience and wit before she can convince the king even to see her. After passing every test that Charles’ men throw at her, she is eventually embraced by the French monarchy. Joan soon leads the charge against the English, miraculously achieving multiple victories in battle. Ng takes great pains to show Joan’s humanity and compassion for the casualties of war on both sides. As the fighting continues, Ng portrays Joan’s capture by the British as well as her difficult trial in their courts. Throughout this harrowing period for Joan, St. Margaret offers her solace. Despite the unusual narration, Ng manages to draw readers to Joan’s side during her tribulations, and he creates sympathetic characters in both Joan and Margaret. Readers might hope that divine intervention will lead to a different outcome than in the true historical account. An engrossing religious and historical account that would make a valuable companion to a high school history unit on Joan of Arc.